The First Winchester! 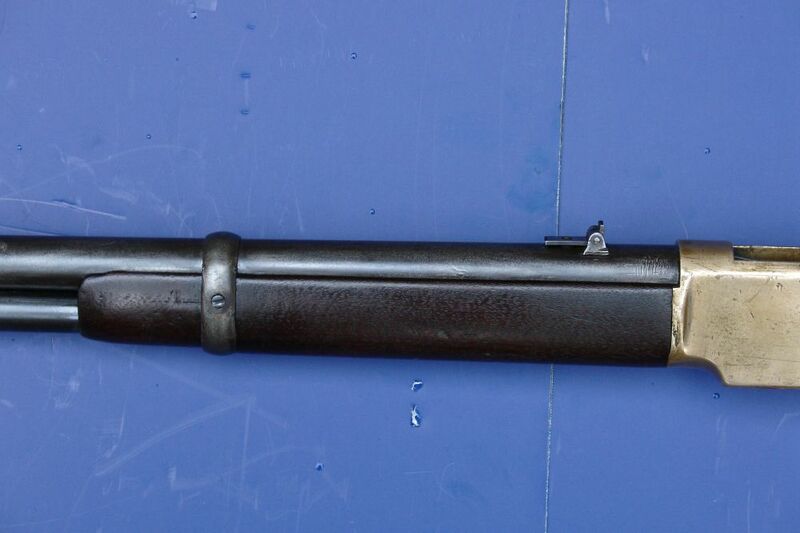 Unlike most 1866's we find today which were used harder than probably any other Winchester, this is a good strong example of an early 3rd Model 1866 Winchester saddle ring carbine. It has a serial number in the 39,000 range and was built in 1870. All matching assembly numbers on the tang, stock, and buttplate. 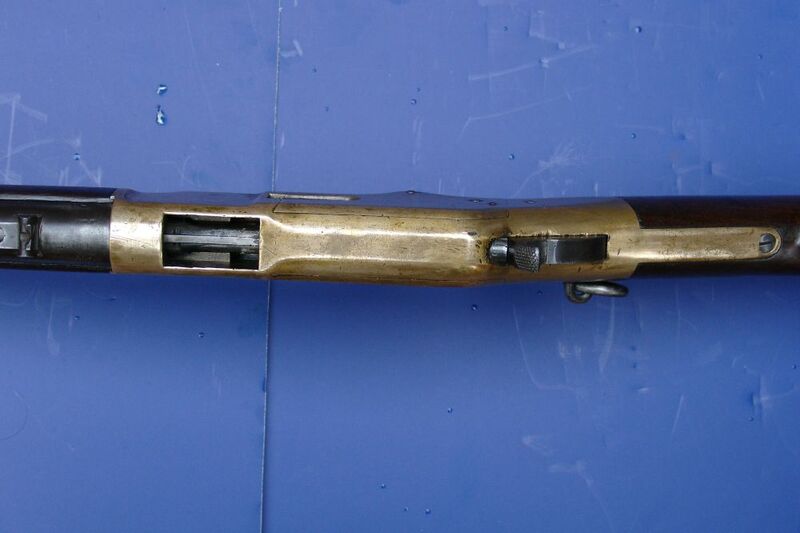 This gun is all original and correct with a 20" round barrel, full magazine, saddle ring, screw-in magazine tube plug, pinched front sight on the barrel band, short ladder rear sight with 1,3, and 500 yard graduations, and the early style brass rifle buttplate found on carbines usually under the 100,000 serial range. 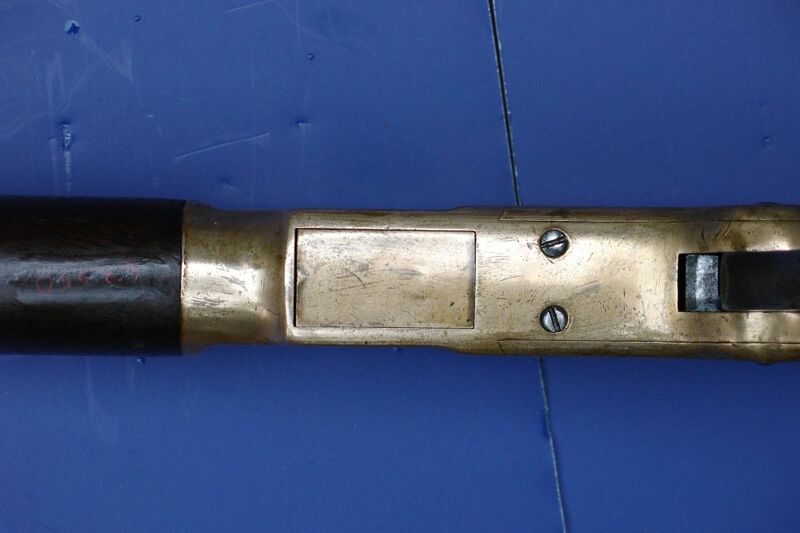 Afterwards, they use the semi-crescent style found on the Model 1866 musket. It has a good barrel address with Henry's original October 1860 and King's March 1866 Patent dates along with the New Haven, Connecticut address. This particular gun was probably not actually made in New Haven, but Bridgeport Connecticut. Following the Civil War and the success of the Henry Rifle, Oliver Winchester needed a bigger factory so he moved the plant in 1867 to a new building in Bridgeport while keeping his home offices in New Haven. The Bridgeport plant operated from 1867 through 1870 before Mr. Winchester purchased land to build a new building and moved plant back in New Haven in 1871. For a 66 carbine, this one hasn't seen much use. Overall, its in NRA Very Good Condition. There are traces of original blue in protected areas of the loading port, barrel, and still some age-darkened blue on the magazine tube. 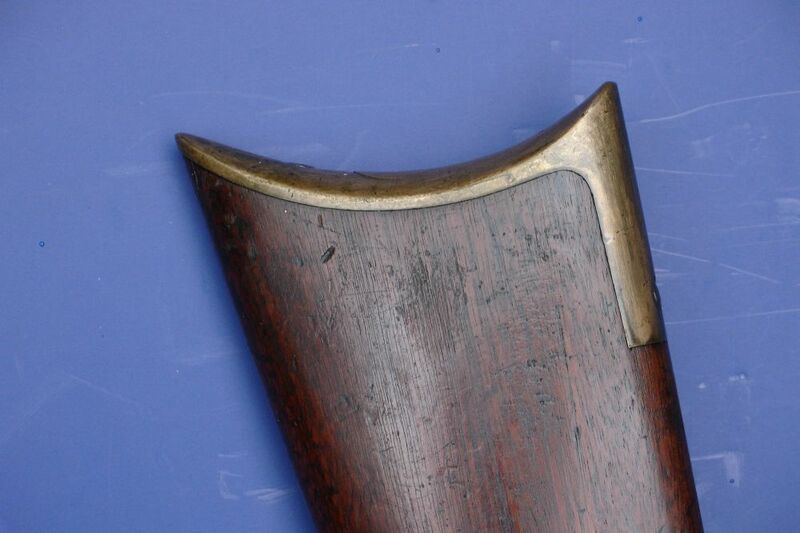 The barrel has some light turn marks near the frame which is fairly common on surving Model 1866's. The brass frame and buttplate have turned to a light mellow patina that is beginning to darken with age. The wood is in Fine condition with only minor handling marks and nice edges. Great wood to metal fit. As mentioned earlier, the stock and buttplate are both number to the frame. 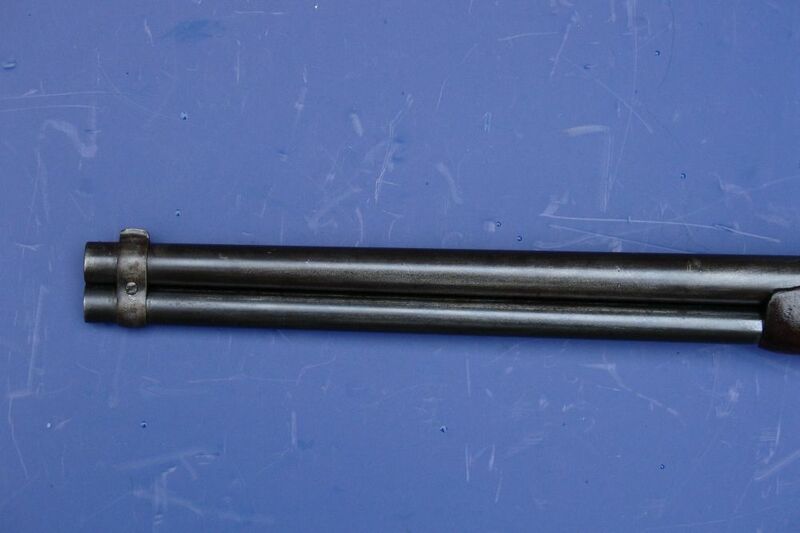 Fine bore with strong rifling and a good action. 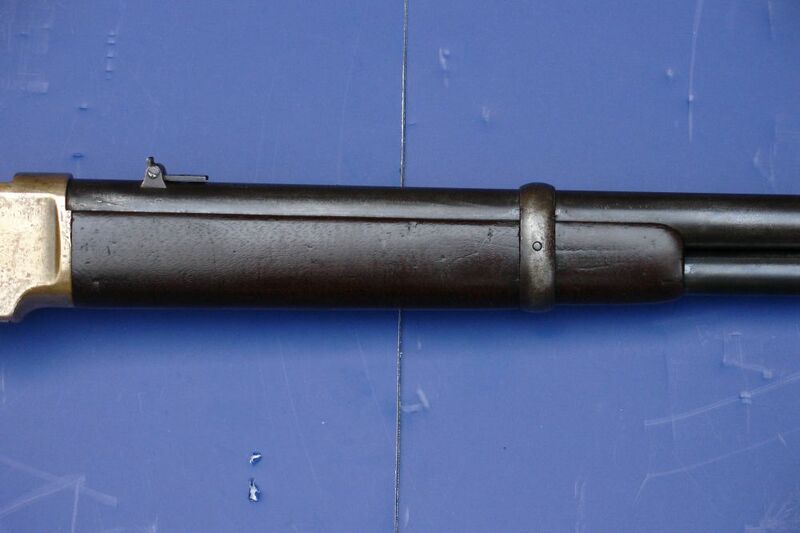 A very strong example of an early Model 1866 that was widely used in the West and throughout the World. As American collectors, when it comes to the name Winchester, we tend to focus on our history, the Western expansion in particular. 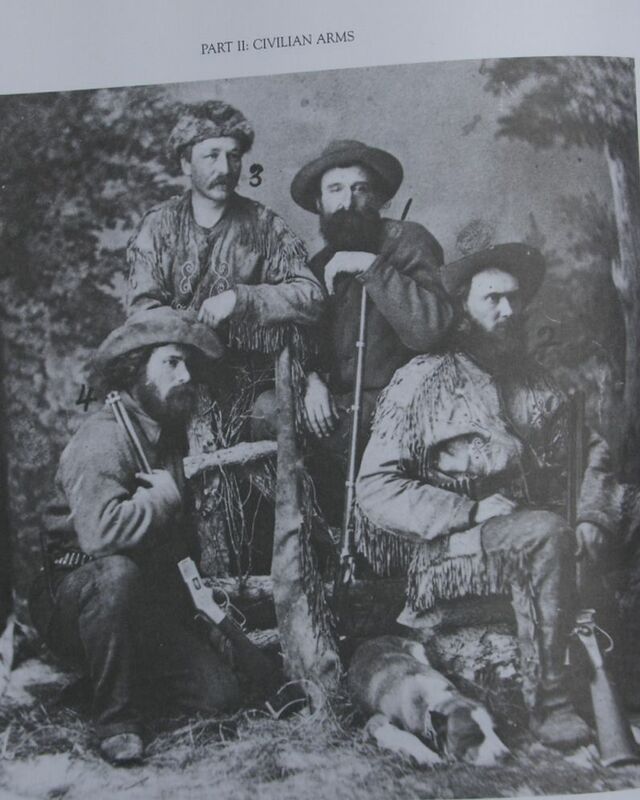 See photo of early Western Explorer Jack Cale and his Model 1866 Carbine who helped discovered Gold in the Black Hills of the Dakota Territory, Circa 1874. We also know now that the Sioux successfully used a number of Model 1866's and and an array of other repeating rifles to defeat Custer at the Battle of Little Big Horn in 1866. 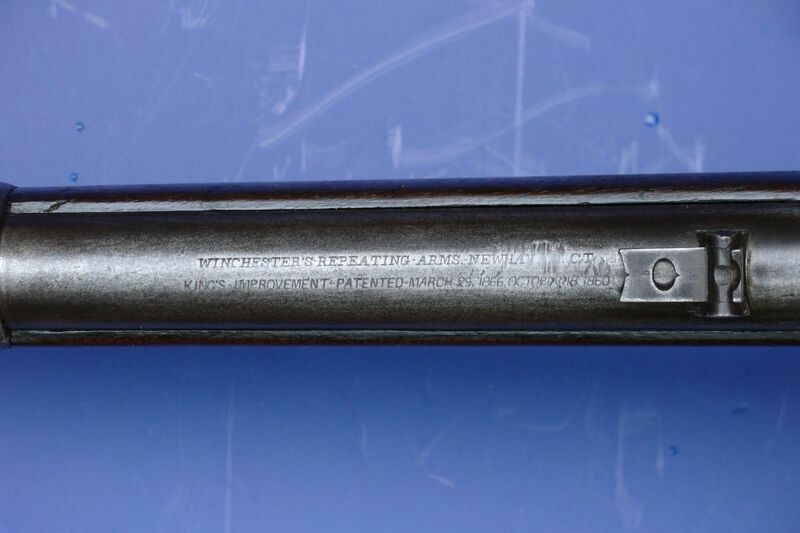 However, we tend to overlook that Winchester distributed its repeaters world-wide...many of which went on to play a part in other significant historical events. 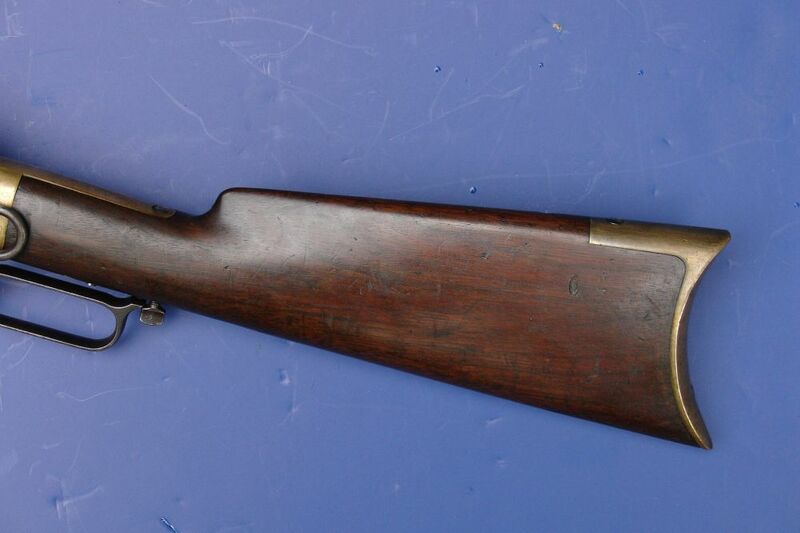 One interesting thing about this Model 1866 is its serial range. 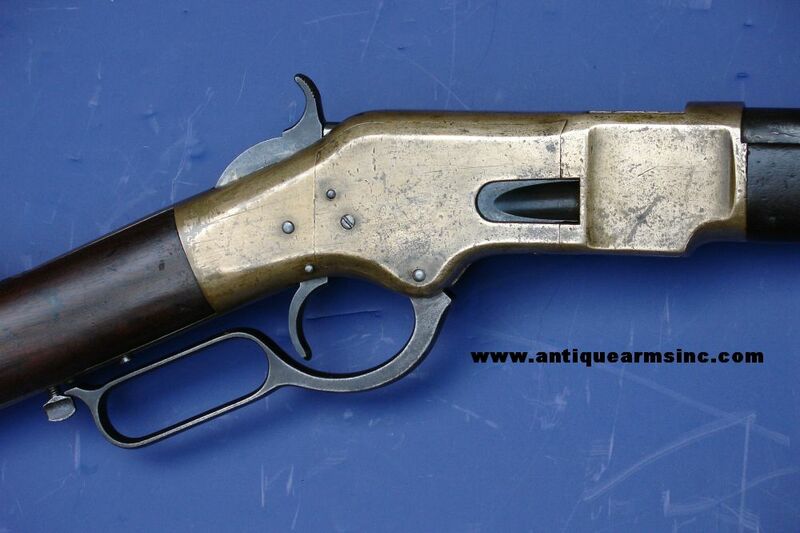 Many Model 1866's in the 1870 era/30,000 serial ranges have turned up in many interesting places throughout the world. As new guns, these would have been the most effective repeating rifles in the World back in 1870. Stanley even carried a Model 1866 Rifle in the 33,000 serial range to Africa in search of Dr. Livingstone in 1871. 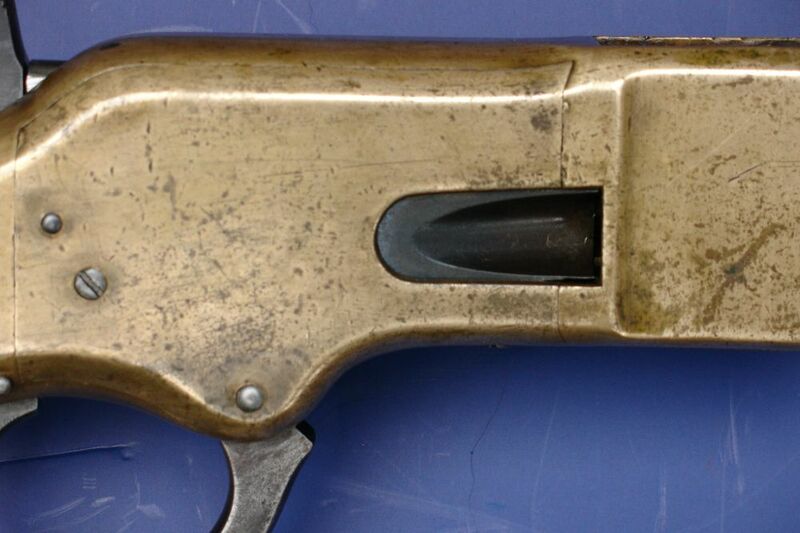 Its believed that Stanley picked was given his Model 1866 from the American Ambassador in Constantinople while in Turkey. 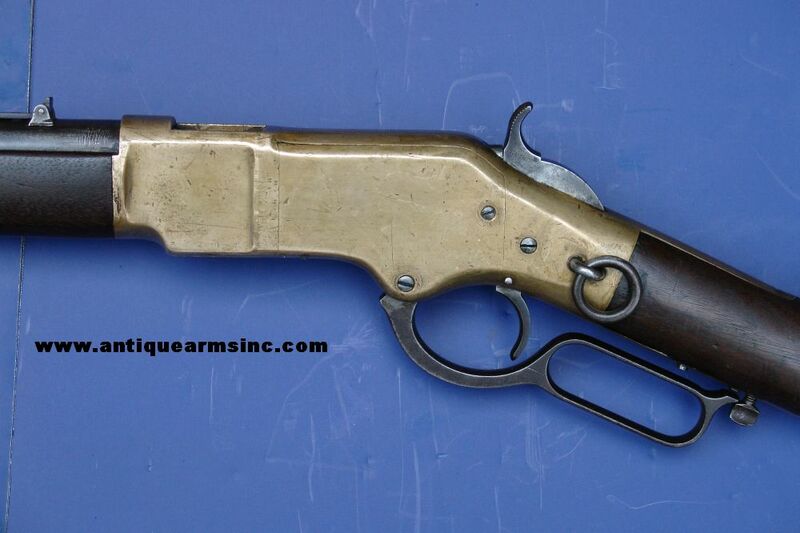 That wouldn't be hard to believe as the Model 1866 had become quite popular in that part of the World. After Oliver Winchester failed to impress the US Military with his repeating rifle, he turned to the World market for orders. He sent several Model 1866's to high ranking Turkish officials. In turn, the Turkish Government ordered between 50,000 66's...mostly muskets and carbines to arms its troops during 1870-71. In 1877, these same Turkish troops armed with 8000-12000 Model 1866 muskets successfully repulsed a much larger Russian Army from the City of Plevna not once, but three times in an unprecedented display of firepower never before seen in the annals of human warfare. While this smaller Turkish force was eventually defeated outside of Plevna, the effectiveness of the Model 1866 rifle caused much of Europe to re-think its infantry weapons. 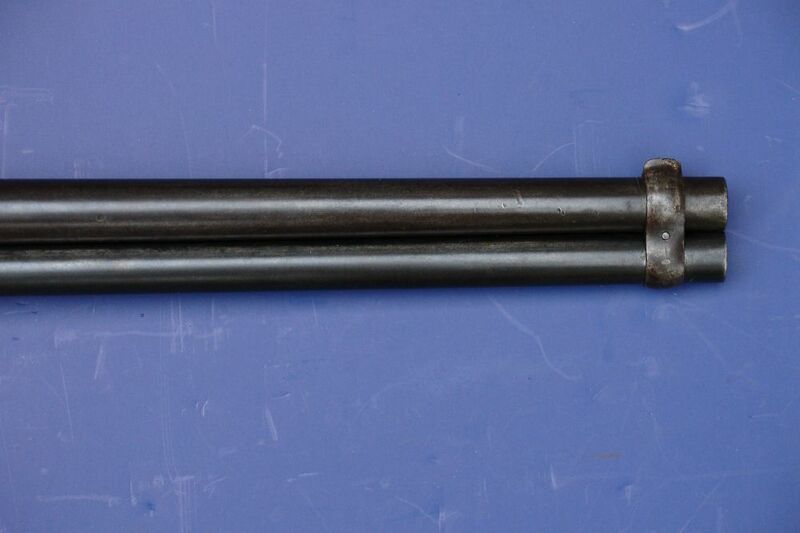 For example, the German Model 71/84...a bolt action repeating rifle with tubular magazine, is a direct result of the hard lessons the Russians learned from Winchester Model 1866 design at Plevna. 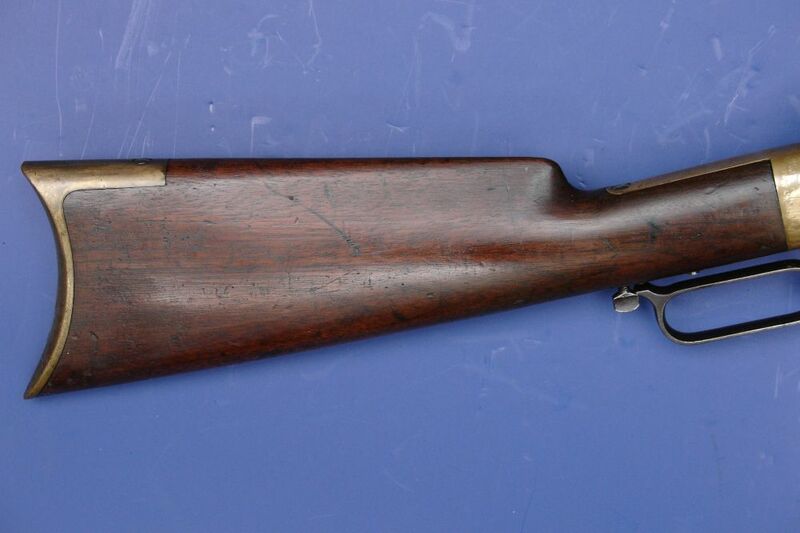 The Model 1866 was also used extensively throughout South and Central America as well as Southern Africa.